Author Marie PagePosted on 9th November 2016 6th February 2017 Categories FAQsLeave a comment on What do all the song section abbreviations mean in Worship Backing Band? 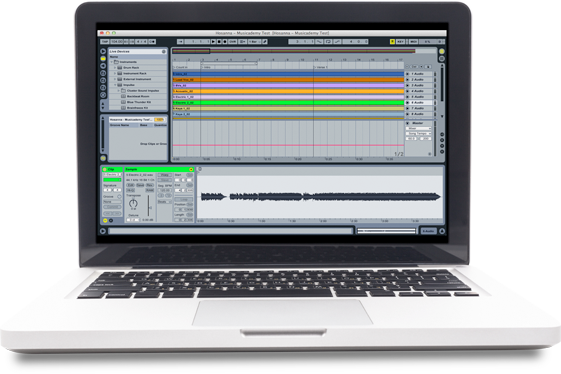 Which two questions are always asked about our MultiTrack Player and tracks? Can you use multitracks from other suppliers in our Worship Backing Band player? In short, yes you can – but they have to be in WAV (not MP3) format and of course you will need to programme the verse/chorus/bridge ‘marker’ points into the player yourself. We go into detail as to how to do this on our FAQs and ‘how to’ videos. However… we’ve designed both our player and our tracks specifically for use in live church worship AND for people who aren’t necessarily technically minded. 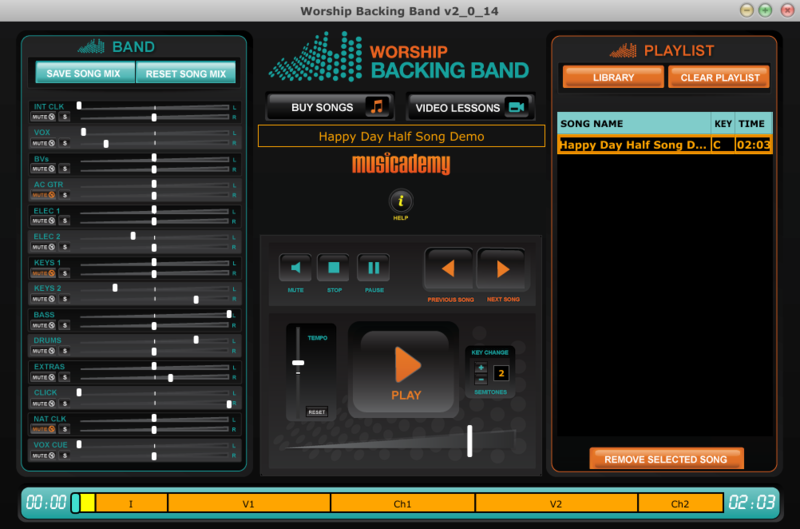 So if you find Ableton or regular DAW software complicated or time consuming in setting up a play list of songs for worship we’d suggest using both our Worship Backing Band Player and our MulitTracks as they work seamlessly together without the set up time. We’ve a good selection now – you can see a full listing here. They have both lead and background vocals. Most other suppliers multitracks don’t have any vocals. Have you tried following a track without any vocals? It’s really hard! Plus there’s nothing to help you if you get lost! 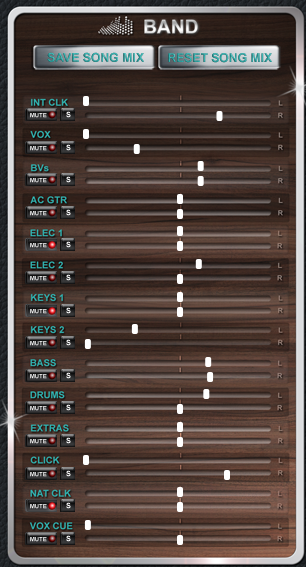 Why not set up our vocals at a low level in your monitor mix to help cue you? All our tracks also have a spoken word vocal cue to remind you of what section is coming next and even hard-to-remember lyrics. No other multitracks do this plus the background vocals are perfect if you don’t have any harmony singers. They are recorded in congregational keys with congregational arrangements. Some churches prefer to sing all with the original artist multitrack recordings but we don’t think that’s always such a good idea. Firstly many original tracks are recorded to sound best with the artist’s own voice but most of the time the key is too high. We record all our songs in congregational keys and we also look very closely at the arrangement, so there’s always band friendly chord changes, intros, outros and song lengths suitable for average sized churches. I.e. We make the 12 minute ‘Bethel’ arrangements much more succinct! Can we use tracks from CDs or from YouTube in the MultiTrack Player? The answer to that is no. Tracks from CDs, iTunes, and other MP3s etc aren’t multitrack recordings. In other words you can’t take a standard stereo recording thats been mixed together and retroactively split out the multitrack instrument parts. It’s simply not possible on our system or any other. MultiTracks are made up of the separated instrument “stems” and our player lets you play them together, simultaneously, allowing you to mix, mute or solo any individual instrument . When you buy a MultiTrack recording from us you are buying 14 different versions of the same song, all featuring an individual instrument. And there’s always a third question about how flipping expensive the tracks are compared to buying a song off iTunes! 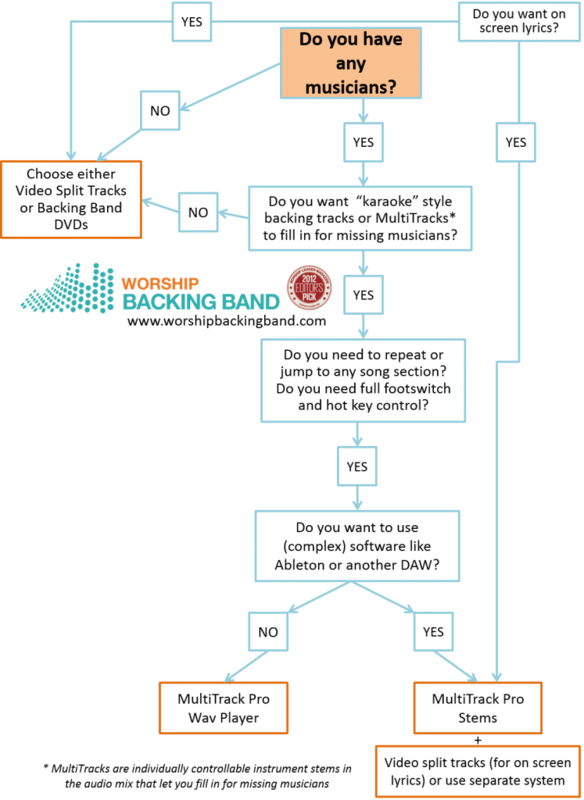 People mention the financial outlay to get up-and-running with MultiTracks in comparison to buying a single backing track or song from iTunes. We respond very honestly to this. 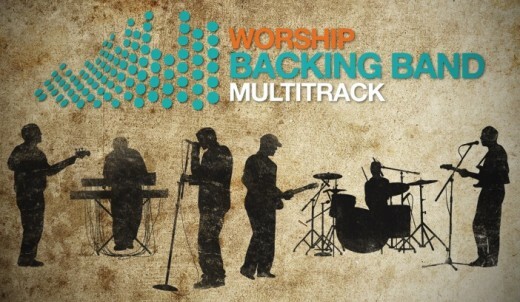 Firstly, as we’ve said Worship Backing Band MultiTracks are cheaper than the tracks you buy from the two biggest alternative suppliers. PLUS our tracks include lead and background vocals which our main competitors tend not to include. Our main customers are small churches with limited cash, rather than those that have paid worship leaders and a generous worship budget, so we have tried hard to price accordingly. Secondly, do be aware that when you buy a MultiTrack you are buying a LOT more than just a song file from iTunes, what you’re really buying is 14 very high quality song files that fit together seamlessly. This is basically the track as recorded in the studio in high quality WAV format – quite a valuable commodity. These WAVs are chunky uncompressed files (perhaps as big as 500MB – that alone tells a story about how different they are to a 4 mb MP3 with inferior compressed audio). Finally, we’d ask what value you place on your worship? These songs will be sung many many times by your congregation. That’s generally a few cents a song for each congregant. We charge what we need to to cover our recording costs, the development of the Player, the production costs of the tracks and our marketing and admin overhead. And a pretty large chunk goes out to the song writers and publishers each time a track is sold. Author Marie PagePosted on 9th November 2016 6th February 2017 Categories FAQsLeave a comment on Which two questions are always asked about our MultiTrack Player and tracks?